Rockabye Baby! — which transforms timeless rock songs into beautiful instrumental lullabies — will release "Rockabye Baby! Lullaby Renditions Of Rush" on January 29. “Rockabye Baby” was developed by Van Halen singer David Lee Roth’s sister Lisa Roth, in conjunction with CMH Records. The series includes collections made from the songs of artists like AC/DC, Metallica, Aerosmith, Pearl Jam, The Beatles, and many others. "Do you have a modern-day warrior putting up a fight at bedtime? Looking for a reliable way to put baby to sleep and not some fly-by-night sandman? Try Rockabye Baby’s tender lullaby versions of Rush's hard-rock hits. This magic music will bring your baby closer to the heart of slumberland." 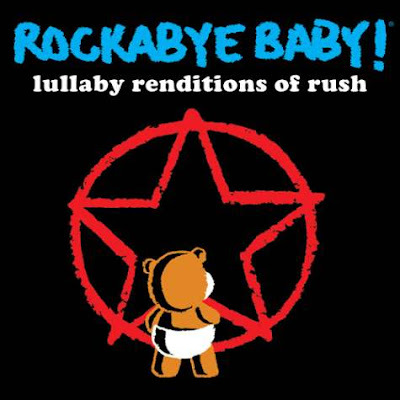 Audio preview samples of the full “Lullaby Renditions Of Rush” album can be heard at Rockabye Baby here. Check out the full library of Rockabye Baby albums at iTunes here. "Rockabye Baby! Lullaby Renditions Of Rush"